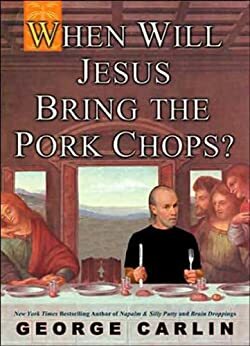 On the heels of George Carlin's #1 New York Times bestseller Napalm & Silly Putty comes When Will Jesus Bring the Pork Chops?--infused with Carlin's trademark irreverent humor and biting cultural observations. Here we go again . . . George Carlin's hilarious When Will Jesus Bring the Pork Chops? offers his cutting-edge opinions and observational humor on everything from evasive euphemistic language to politicians to the media to dead people. Nothing and no one is safe! Carlin on the battle of the sexes: Here's all you have to know about men and women: women are crazy, men are stupid. And the main reason women are crazy is that men are stupid. Carlin on hygiene: When did they pass a law that says the people who make my sandwich have to be wearing gloves? I'm not comfortable with this. I don't want glove residue all over my food; it's not sanitary. Who knows where these gloves have been? Carlin on evasive language: Just to demonstrate how far using euphemisms in language has gone, some psychologists are now actually referring to ugly people as those with "severe appearance deficits." Hey, Doctor. How's that for "denial"? Carlin on politics: No self-respecting politician would ever admit to working in the government. They prefer to think of themselves "serving the nation." To help visualize the service they provide the country, you may wish to picture the things that take place on a stud farm. The thinking person's comic who uses words as weapons, Carlin puts voice to issues that capture the modern imagination. For instance, why are there Ten Commandments? Are UFOs real? What will the future really be like? This brand-new collection tackles all that and more. In When Will Jesus Bring the Pork Chops? Carlin's razor-sharp observations demolish everyday values and leave you laughing out loud--delivering exactly what his countless fans have been waiting for. I enjoyed this book tremendously in parts but not so much in other parts. His wonderful wit and intelligence are always present. And his humor and outlook on life is right there on the surface. However, for me there was something about George Carlin's presentation of his material in person that made it work for me more effectively than the printed word did. He was so "in your face" with it. You could not possibly misunderstand or pretend to not see all the layers of the world beneath his wisdom. His use of words and appreciation of language are so phenomenal (and that does show through in the book almost as well as in person). When he is on stage he is somehow everyman. In the book I felt he was trying too hard. It did not work as well for me. Sometimes he sounds too forced and strident. This was never true when he was on stage. Keep in mind I am thoroughly impressed with George Carlin.. I love his humor and philosophy of life. this book has some good material although it is always funnier with George's delivery of course.